The visual appearance of endometriosis is important because every intellectual and therapeutic process begins with a surgeon identifying disease. Inaccurate identification of disease can introduce selection bias at a first-order level and confound all conclusions, leading to inaccurate concepts of epidemiology, natural history, disease origin and treatment. The history of study of endometriosis is distinguished over the years by the recognition at surgery of progressively subtle manifestations of disease. However, many of the concepts guiding conventional wisdom stem from older articles written by authors unaware of all visual appearances of endometriosis. Although awareness of the protean and frequently subtle visual manifestations has increased irregularly among clinicians, application of this awareness toward greater understanding and better therapy has lagged. The numerical importance of atypical, subtle, non-hemorrhagic disease has recently been shown: at least two-thirds of patients have a visual appearance of disease that many clinicians have not been trained to recognize, while up to 40% have only such disease. Errors of visualization can be aggravated by lack of biopsy control and possibly by use of video monitor systems. Misdiagnosis and misunderstanding are consequences of this visual selection bias. The visual appearance of endometriosis historically has been described both in terms of distorted anatomy as well as of color appearance. Early authors, working from a laparotomy perspective, introduced concepts of the disease derived from cross sectional surveys of older patients with ovarian endometriomas, adhesions and obliterated cul-de-sacs [1, 2, 3, 4]. Thus a crude fertility rate of less than 40% was identified in patients with disease that would today be considered severe or stage IV . These early studies concentrated heavily on ovarian disease no doubt because severe endometriosis is more obvious in its overall clinical and surgical presentation than milder forms of the disease. Even Sampson eventually realized that peritoneal disease was more common and clinically more significant than ovarian disease , but the notion that the ovaries are the most common site of disease [7, 8, 9, 10] had been irretrievably inoculated into the literature, although not unanimously [11, 12]. However, even in a large referral practice devoted primarily to patients with endometriosis, when knowledge of the full spectrum of visual manifestations is applied to all patients (Table 1) severe disease and ovarian involvement are still not as common as lesser stages of the disease and peritoneal disease. These findings are similar to earlier findings in a smaller group of non-referred patients in early years of practice . Conclusions based on observations among patients with severe or predominantly ovarian disease may not be applicable to the majority of patients who have lower stage disease. Color appearance of endometriosis is the other morphological characteristic all surgeons initially respond or don't respond to at surgery. Since most patients with endometriosis do not have the severe anatomic distortion found in Stage III and IV disease, color appearance is the single most important factor in the identification of disease. Since ovarian endometriomas are filled with dark bloody fluid, Sampson  used the word "chocolate" in his title to describe these cysts, and incidentally described peritoneal disease as a "hemorrhagic bleb", thus initially connoting a dark, hemorrhagic appearance to the disease. Meigs noted "dark, chocolate-colored or tarry fluid" in endometriomas  and "blue, black or purple" peritoneal disease . Unaware that endometriosis has fundamental biologic differences from native endometrium [14, 15, 16, 17, 18, 19], Sampson [2, 20] understandably adopted the concept of cyclic menstruation by endometriosis coincident with normal menstruation. This reinforced the concept of a dark, hemorrhagic visual appearance of disease which may reliably and consistently change in appearance with the menstrual phase, although modern study fails to support this notion . Some early studies, however, illustrated white coloration as a manifestation of disease [20, 21], and colorless lesions were first mentioned by a general surgeon in 1950 . Many authors over the years have spoken of peritoneal disease as dark or black hemorrhagic lesions [22, 23, 24, 25, 26, 9, 27, 28, 29]. To this day clinicians speak of the "black powder-burn implant," although the origin of this term is uncertain. Little damage would be done to our concepts of endometriosis if dark or hemorrhagic lesions were by far the most common color appearance of disease. However, although many authors over the years have mentioned disease of other colors and of varying degrees of subtlety [20, 11, 21, 30, 31, 32, 33, 34, 35], several modern reports have confirmed visual dominance of such non-hemorrhagic, atypical or subtle lesions [36, 37, 38, 39, 40]. These reports on the visual appearances, each using simple color classification schemes, indicate not only that most patients have non-black disease which most clinicians could potentially overlook, but that numerically, the black powder-burn lesion is out-numbered by lesions of other color appearances (figures 1-3). These findings are consistent among patients presenting primarily with infertility , pain [37, 39], in rural non-referral general practice  or urban referral practices [36, 40, 39]. Between 15%  and 40%  of patients with endometriosis have only non-black or subtle disease. As older age groups of patients are examined, a crude suggestion of evolution in color appearance of endometriotic lesions from non-pigmented to hemorrhagic and black forms has been noted [30, 36, 37], although any color appearance can be found in any age group. If unrecognized, this evolution in appearance of endometriosis with advancing age can lead to misdiagnosis and inaccurate concepts of the natural history of the disease. A surgeon may judge a patient to have little or no endometriosis initially, find more obvious disease at a subsequent surgery and conclude that new or recurrent disease has appeared, when actually persistence of disease has been unmasked. Older reports characterized patients with mean ages in the mid or late thirties, which is when the black lesion predominates, so it is no surprise that the "black powder-burn implant" is the predominant lesion of historic note. Figures 1-3 (left to right): Examples of atypical endometriosis. Figure 1. Multiple subtle atypical lesions of endometriosis as indicated by the arrows. Figure 2. A single white lesion in the cul-de-sac. Figure 3. Histology of the excised lesion in figure 2 reveals endometriosis, as indicated by the yellow arrows. The confounding effect of these considerations of visual appearance on the published literature may be immense, and is hinted at by a recent study. In a non-referral general gynecologic practice in rural Oregon, which presumably should be as representative a population of patients with endometriosis as most clinicians are likely to see, appreciation of these subtle lesions at surgery has led to somewhat surprising findings. Using a simple pelvic map to gauge extent of endometriosis by the number of pelvic areas involved by disease, no strong linear evidence could be found of a consistently protective effect of pervious parity . Also, although uncorrected for patients never attempting pregnancy, most patients with disease were parous, an observation noted by many others [41, 42, 43, 44]. The same pelvic mapping found no evidence for an increase in the number of pelvic areas involved by disease in older age groups . This seeming lack of progressive spread of disease in humans parallels the finding of lack of spread of experimental endometriosis in monkeys, where tonic, non-cyclical administration of either estrogen or progesterone [45, 46] or both  in a tonic  or cyclic  fashion was noted to maintain but not to result in distant spread of disease. Experimental endometriosis in animals involves autologous transplantation of native endometrium with normal populations of hormonal receptors. Therefore, application to humans of findings in experimental endometriosis should be made with great temerity since spontaneous endometriosis in monkeys  or humans lacks normal populations of hormonal receptors found in native endometrium and pathophysiologic comparisons may be inaccurate. The color appearance of endometriosis is subjective, and inter-observer variation and the protean appearances possible with endometriosis make discrete categorization of all lesions nearly impossible and raise questions about performance bias among different clinicians in collaborative studies. Simply stated, the pelvic surgeon's guiding principle must be this: any abnormality of the pelvic peritoneum, no matter how small, how subtle, or what color must be considered possible endometriosis until proven otherwise by biopsy. The varied visual manifestations of endometriosis likely speak to the biological differences of hormone receptor populations or of functional status. Indeed, the synthesis of prostaglandin F (PGF) by endometriosis varies according to the visual appearance of the lesion . When lesions with hemorrhagic appearances were studied, reddish lesions were found to produce greater amounts of PGF than brownish lesions, which produced more PGF than black powder-burn lesions. Subtle lesions frequently look innocuous, and white lesions are sometimes termed "burned out." Nonetheless, patients can hurt  or have reduced fertility  associated with these subtle lesions, many of which are non-hemorrhagic. Therefore, the temptation to ignore or belittle disease because it appears minimal or "burned out" should be avoided. Also to be avoided is the conclusion that such a visual appearance is evidence of medical or surgical eradication of disease unless absence of disease is confirmed by biopsy. Whichever theory of origin of endometriosis is favored by a clinician, each theory necessarily implies existence of early and intermediate stages of disease before the classic black powder-burn lesion is found. The modern identification of these subtle lesions satisfies nicely the requirement that there must exist way stations on the road to more visually classic disease. Therefore, these lesions have important historic, symptomatic and ontologic roles. Further study of these lesions in progressively younger patients will allow researchers to discover their origin, thus unlocking important biologic and epidemiological secrets. Subtle lesions, like more obvious disease, can have protean microscopic appearances with variable amounts of stroma surrounding glandular elements, with or without subclinical adjacent hemorrhage. Since published descriptions of the histology of endometriosis have ranged from requiring glands and stroma to accepting biopsy-negative material as endometriosis if only it looked like endometriosis at surgery, modern authors describing subtle disease with glands and stroma as the basis of histologic diagnosis seem well-founded. Not all biopsies of subtle peritoneal lesions return as endometriosis. Chronic inflammation, peritoneal microcalcifications and glandular inclusions are occasionally found, although less commonly than endometriosis. Several important conclusions can be drawn from the above discussion: if at least two-thirds of patients have disease which may be overlooked by many surgeons, then under-diagnosis at surgery is routine, and an unquantifiable degree of visual selection bias has been built into our understanding of endometriosis. Also, the prevalence of endometriosis in the general population may be almost double previous estimates, since complete failure to diagnose may be possible in up to 40% of patients who have only non-black lesions. Finally, the fundamental importance of biopsy control to the scientific process is affirmed, since modern studies confirming the numerical importance of the protean visual manifestations have a high degree of biopsy control. Regarding the confusion which has accompanied study of the disease for decades, it seems likely that incomplete identification of disease and lack of biopsy control have played roles. Microscopic endometriosis: can it be visualized? Accompanying the identification of increasingly subtle lesions of endometriosis has been the concept of microscopic peritoneal disease in one-quarter of patients . One implication of microscopic disease is that it can't be seen and therefore can't be destroyed surgically. However, two studies have failed to confirm the concept of invisible microscopic peritoneal endometriosis [36, 50]. There are significant differences in visualization methodology which may explain disparate findings. Murphy and colleagues studied 20 patients with Stage III and IV disease at laparotomy and took large (1-3cm) biopsies of what was considered by consensus to be visually normal peritoneum. Using scanning electron microscopy at low power, 25% of patients were noted to have glandular openings compatible with endometriosis of the peritoneal surface. Jansen and Russell , using undefined criteria for normal peritoneum, obtained 10 peritoneal biopsies of unknown size from the uterosacral ligaments of an unknown number of patients via laparoscopy and all biopsies were negative for endometriosis by light microscopy. 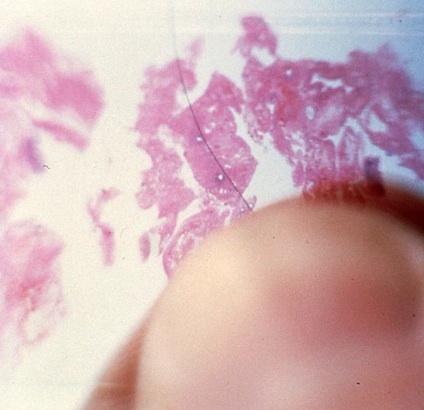 Redwine , using defined criteria for normal peritoneum in Stage I and II patients, magnification obtained by advancing the tip of the laparoscope to about 10mm from the peritoneal surface, and taking small biopsies of posterior pelvic peritoneum in 24 patients with and 9 patients without endometriosis, failed to find endometriosis in any study specimen studied by step sections under light microscopy. It is clear from these studies that most patients with endometriosis do not have microscopic disease that is invisible, since all authors were consistently able to identify peritoneum devoid of endometriosis in a high percentage of patients by whatever selection process used. It seems that laparoscopy provides a more precise method of identifying normal peritoneum than visualization at laparotomy. In fact, Murphy and colleagues, using a technique similar to Redwine's, were themselves unable to find endometriosis in normal peritoneum, although these results were not emphasized . Surgical pessimism is therefore not warranted. It should be possible to find and surgically destroy all of the peritoneal endometriosis in between 75% and 100% of all patients, since the hallmark of endometriosis is abnormal peritoneum. ...surgical pessimism is not warranted. It should be possible to find and surgically destroy all of the peritoneal endometriosis in between 75% and 100% of all patients, since the hallmark of endometriosis is abnormal peritoneum.. The smallest visual angle detectable by the human eye under ideal experimental conditions is 0.5 second of arc, while normal visual acuity allows for easy detection of one minute of arc . One-half second of arc at arm's length (70cm) corresponds to a distance of only a few microns. Therefore, the unaided human eye is optically capable of seeing endometriotic lesions less than 100 microns in dimension (figure 4), even more so with magnification gained at near-contact laparoscopy. In panoramic use, however, the laparoscope will reduce the apparent size of viewed objects, thus placing even more hemorrhagic appearances beyond human visual acuity. Visual acuity involves more than just optical resolution, however. It includes the psychic process that requires knowing what is normal peritoneum and what is not. This can be gained only by experience, attention to detail and vigorous biopsy control. The unaided human eye is optically capable of seeing endometriotic lesions less than 100 microns in dimension. As this image demonstrates, "microscopic" endometriosis can be seen at arm's length. A concept parallel to that of "microscopic" endometriosis is that of "obvious endometriosis" which cannot be confirmed histologically. This has been suggested to occur in about one third of patients . These "obvious" visual changes either are or are not caused by endometriosis. If the visual changes are due to endometriosis, then perhaps the microtome didn't section through the glands and stroma, and the disparate results are due to sampling error in the lab. If the visual abnormalities are not due to endometriosis, but are due to some inherent ability of the peritoneum to produce such visual changes, then calling these appearances endometriosis would be incorrect and lead to an unquantifiable degree of opinion and confusion in the literature since it would allow diagnosing a disease by its biopsy-proven absence. Sampson in 1921 illustrated the importance of biopsy control in the study of endometriosis by showing that in his series over half of chocolate cysts of the ovary were not endometriotic . It has not been demonstrated what percent of the protean visual manifestations of endometriosis can be seen on a video monitor. Video systems do not resolve details as well as the human eye. Video monitors have not played a role in modern study of the subtle appearances of endometriosis [37, 40] or microscopic endometriosis [49, 36, 50]. Caution is therefore warranted in their application to treatment and scientific study of endometriosis. Successful medical treatment of endometriosis is frequently gauged by non-specific means such as response of the symptoms of pain or infertility. Although it seems clear that endometriosis is a frequent cause of pain, the relationship to infertility has remained pathoconsortive rather than proven cause-effect . Therefore, repeat surgical investigation is a more accurate means of gauging true disease response to medical or surgical therapy. At repeat surgery, the investigator has the option of confirming visual impressions by biopsy. This is not always done, however. Examples follow of the pitfalls of visual assessment of disease before or following medical therapy. Pseudopregnancy therapy of endometriosis was based on the assumed fact that pregnancy prevents or improves endometriosis, although there was no proof of this at that time . Impetus for pseudopregnancy came from surgical observations on a 25 year old patient. A dark brown, collapsed cystic structure on her right ovary was removed at cesarean section and microscopically exhibited decimal change, occasional necrosis and possible endometrial stroma. No glandular element was found. Although symptomatic with pain before pregnancy, the patient did not have an antepartum surgical diagnosis of endometriosis, yet it was concluded that pregnancy had cured her ovarian endometriosis. Subsequent studies which evaluated endometrial rather than endometriotic response [56, 57, 58] allowed the notion to exist for some time that pseudopregnancy could cure endometriosis when actually persistence of disease was the rule [59, 44]. Development of pseudo menopausal therapy with danazol was also affected by considerations of visual appearance. One influential study  was illustrated by many "before and after" photographs showing apparent resolution of classic lesions of endometriosis. Biopsies were taken after treatment from areas that were still suspicious for endometriosis, and 15% of patients had residual disease. Biopsies were not taken of areas of visual resolution or improvement of disease. Although hope was raised that endometriosis could be eradicated by pseudo menopausal therapy, it now appears that danazol does not eradicate endometriosis of any stage or location [61, 62, 63, 64], but only reduces adjacent peritoneal reaction. This apparently reduces a "classical" hemorrhagic appearance to a non-hemorrhagic appearance, with the strong visual impression that disease has been eradicated when in fact it has not . Gonadotropin-releasing hormone agonists (GnRHa) are now being studied and provide a contemporaneous example of the strong effects of visual appearance of disease. As with early danazol studies, one early GnRHa study  was illustrated with many "before and after" pictures. Although visual improvement was the rule, the areas of improvement after treatment were biopsied and persistent endometriosis was found in most patients. Other authors have found that GnRHa therapy does not eradicate endometriosis . A recent large randomized, double-blind study  comparing GnRHa to danazol evaluated the visual appearance of endometriosis at the end of therapy during ovarian suppression when visual improvement gives the impression of eradication of disease . Since it is impossible to obtain biopsies from the same group of endometriotic cells before and after medical treatment, histologic study of the results of medical therapy is based on the assumption that any biopsy taken either before or after treatment will be an accurate representation of non-biopsied disease in the pelvis, and that all disease will respond similarly to treatment. Because of the protean visual, histologic and pathophysiologic manifestations of disease that are possible in each patient, this assumption may not always be valid. If inaccurate visual diagnosis is included in the study process, then results of medical therapy are subject to cumulative errors from two sources. Rigorous biopsy control after medical treatment would help dispel confusion regarding terms such as "resolution, regression, atrophy, eradication," and "cure." Initial surgical treatment of endometriosis depends entirely on the surgeon's opinion of which visual changes are likely to be endometriosis and which therefore should be excised, coagulated, or vaporized. The results of surgical therapy can be confounded by incomplete identification and resultant incomplete surgical treatment of disease at the initial surgery, since disease which is overlooked will not be treated. At reoperation, calculation of the persistence rate is subject to this same effect, resulting in a falsely low persistence rate. Furthermore, evolution in appearance of disease will give a spurious impression of the appearance of new disease. If laser vaporization is used, carbon deposition can occur (figure 5), which may be misinterpreted as persistent disease at reoperation. Laser vaporization, electrocoagulation or excision may all leave whitish peritoneal fibrosis which may or may not harbor residual disease. The most meaningful observations of the effects of surgical therapy would therefore be those made by the same observer pre- and post-operatively, applying the same visualization process, with attention to subtle as well as obvious disease, and with biopsy control. The result of prior laser vaporization on superficial endometriosis. Excision and subsequent biopsy of the diseased tissue reveals persistent endometriosis, carbon deposition, and formation of hemorrhagic surface adhesions. All concepts of endometriosis stem from visualization of the disease at surgery. If accurate and complete identification of disease has occurred throughout the history of study, and if the populations studied at surgery have been representative cross sections of the population of patients with endometriosis, then our concepts of disease are on solid ground. If inaccurate and incomplete identification of disease has been coupled with study of populations that are not representative of the disease, then our concepts are inaccurate, misguided in part by cliches of the "black powder-burn implant," "pain is caused by cyclic bleeding of the implants" or "burned out disease." If varying degrees of accurate visual identification are coupled with study of populations that are representative to varying degrees, then a Tower of Babel results. Authors would play the role of the blind men examining the elephant, with the rest of the profession as an audience. Each examiner might see a different disease. Reproductive endocrinologists working in metropolitan infertility clinics will see endometriosis from one bias. General gynecologists in community practice will see it from another. Clinicians with less experience will be influenced by the opinions of the infertility specialists, who may be studying a symptom not actually caused by the disease. Those failing to identify all disease will remain confused and disappointed with their treatment results, although without knowing exactly why. It will sometimes appear that people are not even talking about the same disease. Patients will sense this confusion and become upset. Significant progress in understanding the true nature of the disease will seem elusive. We remain in our infancy of understanding of endometriosis, and there is much more to learn and the entire future in which to learn it. We have a much better appreciation of the spectrum of visual manifestations of disease. The impact of this expanded spectrum will be great, as many avenues of fruitful research in the basic and clinical sciences will open. The accuracy of our observations and the depth of insight into the disease will increase, as will our ability to serve our patients. Confusion surrounding endometriosis will only be dispelled by knowledge gained most accurately by study of excised disease of any appearance, so devising better ways to identify and remove endometriosis seems our current mandate. Cullen, T. S. (1920). The distribution of adenomyomas containing uterine mucosa. Archives of Surgery, 215-283. Sampson, J. A. (1921). Perforating hemorrhagic (chocolate) cysts of the ovary. Archives of Surgery, 3, 245-323. Sampson, J. A. (1922). Ovarian hematomas of endometrial type (perforating hemorrhagic cysts of the ovary) and implantation adenomas of the endometrial type. Boston Medical and Surgical Journal, 186, 445-56. Meigs, J. V. (1922). Endometrial hematomas of the ovary. Boston Medical and Surgical Journal, 187, 1-13. The American Fertility Society (1985). Revised American Fertility classification system of endometriosis: 1985. Fertility and Sterility, 44, 351-352. Sampson, J. A. (1940). The development of the implantations theory for the origin of peritoneal endometriosis. American Journal of Obstetrics and Gynecology, 40, 549-557. Cattell, R. B., & Swinton, N. W. (1936). Endometriosis. -With particular reference to conservative treatment. New England Journal of Medicien, 214, 341-346. Ranney, B. (1980). Endometriosis: Pathogenesis, symptoms, and findings. Clinical Obstetrics and Gynecology, 23, 865-874. Jones, H. W. (1981). Endometriosis. In Jones, H. W. , & Jones, G. S. (eds): Novak's Textbook of Gynecology, 10th edition (pp 609-635). Williams & Wilkins: Baltimore. Pauerstein, C. J. (1989). Clinical presentation and diagnosis. In Schenken, R. S., (ed): Endometriosis. Contemporary concepts in clinical management (pp 127). JB Lippincott: Philadelphia. Fallon, J., Brosnan, J. T., Manning, J. J., Moran, W. G., Meyers, J., & Fletcher, E. M. (1950). Endometriosis: a report of 400 cases. Rhode Island Medical Journal, 33, 15-23. Redwine, D. B. (1987as). The distribution of endometriosis in the pelvis by age groups and fertility. Fertility and Sterility, 47, 173-175. Meigs, J. V. (1941). Endometriosis - its significance. Annals of Surgery, 114, 866-874. Tamaya, T., Motoyama, T., Ohono, Y., Ide, N., Tsurusaki, T., & Okada, H. (1979). Steroid receptor levels and histology of endometriosis and adenomyosis. Fertility and Sterility, 49, 427-431. Janne, O., Kauppila, A., Kokko, E., Lantto, T., Ronnberg, L., & Vihko, R. (1981). Estrogen and progestin receptors in endometriosis lesions: comparisons with endometrial tissue. American Journal of Obstetrics and Gynecology, 141, 562-566. Berqvist, A., Rannevik, G., & Thorell, J. (1981). Estrogen and progesterone cytosol receptor concentrations in endometriotic tissue and intrauterine endometrium. Acta Obstetricia et Gynecologica Scandinavica Supplement, 101, 53-58. Gould, S. F., Shannon, J. M., & Cunha, G. R. (1983). Nuclear estrogen binding sites in human endometriosis. Fertility and Sterility, 39, 520-524. McClellan, M. C., West, N. B., Tacha, D. E., Greene, G. L., & Brenner, R. M. (1984). Immunocytochemical localization of estrogen receptors in the macaque reproductive tract with monoclonal antiestrophillins. Endocrinology, 114, 2002-2014. Metzger, D. A., Olive, D. L., & Haney, A. F. (1988). Limited hormonal responsiveness of ectopic endometrium: histologic correlation with intrauterine endometrium. Human Pathology, 19, 1417-1424. Sampson, J. A. (1925). Inguinal endometriosis (often reported as endometrial tissue in the groin, adenomyoma in the groin, and adenomyoma of the round ligament). American Journal of Obstetrics and Gynecology, 10, 462-503. Kistner, R. W. (1975). Management of endometriosis in the infertile patient. Fertility and Sterility, 26, 1151-1159. Hasson, H. M. (1976). Incidence of endometriosis in diagnostic laparoscopy. Journal of Reproductive Medicine, 16, 135-138. Cohen, M. R. (1977). Endometriois and infertility. Journal of Reproductive Medicine, 18, 209-210. Hasson, H. M. (1979). 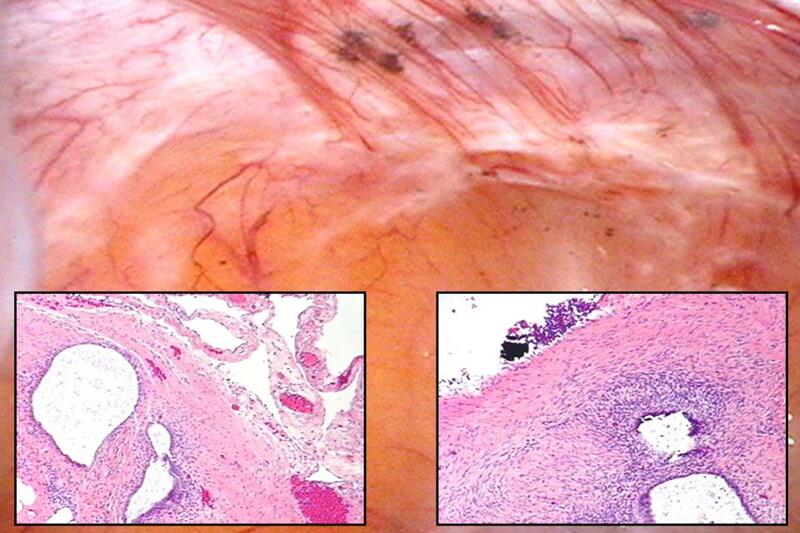 Electrocoagulation of pelvic endometriotic lesions with laparoscopic control. American Journal of Obstetrics and Gynecology, 135, 115-121. Metler, L. (1982). Pathology of endometriosis. In Semm, K., & Greenblatt, R. B. (eds): Genital endometriosis in infertility, X. World Congress of Fertility and Sterility (pp 13). Thieme-Stratton: New York. Weingold, A. B. (1983). Pelvic pain. In Kase, N. G., Weingold, A. B. (eds): Principles and practice of clinical gynecology (pp 512). John Wiley & Sons: New York. DeCherney, A. H. (1983). Endometriosis. In Kase N. G., & Weingold, A. B. (eds): Principles and practice of clinical gynecology (pp 477-482). John Wiley & Sons: New York. Karnaky, K. J. (1969). Theories and known observations about hormonal treatment of endometriosis in-situ, and endometriosis at the enzyme level. Arizona Medicine, 26, 37-41. Goldstein, D. P., De Cholnoky, C., & Emans, S. J. (1980). Adolescent endometriosis. Journal of Adolescent Health Care, 1, 37-41. Chatman, D. L. (1981). Pelvic peritoneal defects and endometriosis: Allen-Masters syndrome revisited. Fertility and Sterility, 36, 751-756. Chatman, D. L., & Ward, A. B. (1982). Endometriosis in adolescents. Fertility and Sterility, 27, 156-160. Dmowski, W. P. (1984). Pitfalls in clinical, laparoscopic and histologic diagnosis of endometriosis. Acta Obstetricia et Gynecologica Scandinavica Supplement, 123, 61-66. Martin, D. C., & VanderZwagg, R. (1987).Excisional techniques for endometriosis with the CO2 laser laparoscope. Journal of Reproductive Medicine, 32, 753-758. Redwine, D. B. (1987). Age related evolution in color appearance of endometriosis. Fertility and Sterility, 48, 1062-1063. Stripling, M. C., Martin, D. C., Chatman, D. L., Vander Zwaag, R., & Poston, W. M. (1988). Subtle appearance of pelvic endometriosis. Fertility and Sterility, 49, 427-31. Davis, G. D., & Brooks, R. A. (1988). Excision of pelvic endometriosis with the carbon dioxide laser laparoscope. Obstetrics and Gynecology, 72, 816-819. Martin, D. C., Hubert, G. D., VanderZwaag, R., & El-Zeky, F. A. (1989). Laparoscopic appearances of peritoneal endometriosis. Fertility and Sterility, 51, 53-57. Haydon, G. B. (1942). A study of 569 cases of endometriosis. American Journal of Obstetrics and Gynecology, 43, 704-709. Counseller, V. S. (1949). Surgical procedures involved in the treatment of endometriosis. Surgery, Gynecology, and Obstetrics, 89, 322-327. Bennet, E. T. (1953). Endometriosis in the older age group. American Journal of Obstetrics and Gynecology, 65, 100-108. Andrews, W. C., & Larsen, G. D. (1974). Endometriosis: treatment with hormonal pseudopregnancy and/or operation. American Journal of Obstetrics and Gynecology, 118, 643-651. Scott, R. B., & Wharton, L. R. (1957). The effect of estrone and progesterone on the growth of experimental endometriosis in the rhesus monkeys. American Journal of Obstetrics and Gynecology, 74, 852-863. DiZerega, G. S., Barber, D. L., & Hodgen, G. D. (1980). Endometriosis: Role of ovarian steroids in initiation, maintenance, and suppression. Fertility and Sterility, 33, 649-653. Sternfeld, M. D., West, N. B., & Brenner, R. M. (1988). Immunocytochemistry of the estrogen receptor in spontaneous endometriosis in rhesus macaques. Fertility and Sterility, 49, 342-348. Vernon, M. W., Beard, J. S. , Graves, K., & Wilson, E. A. (1986). Classification of endometriotic implants by morphologic appearance and capacity to synthesize prostaglandin F. Fertility and Sterility, 46, 801-806. Murphy, A. A., Guzick, D. A., & Rock, J. A. (1989). Personal communication. Moses, R. A., & Hart, W. M. (1970). In Moses, R. A., & Hart, W. M. (Eds): Adler's physiology of the eye. The C. V. Mosby Company: St. Louis. Chatman, D. L., & Zbella, E. A. (1987). Biopsy in laparoscopically diagnosed endometriosis. Journal of Reproductive Medicine, 32, 855-857. Wheeler, J. M. (1989). Epidemiology of endometriosis-associated infertility. Journal of Reproductive Medicine, 34, 41-46. Kistner, R. W. (1958). The use of newer progestins in the treatment of endometriosis. American Journal of Obstetrics and Gynecology, 75, 264-2878. Kistner, R. W. (1962). Infertility with endometriosis. A plan of therapy. Fertility and Sterility, 13, 237-245. Kistner, R. W. (1966). Current status of the hormonal treatment of endometriosis. Clinical Obstetrics and Gynecology, 9, 271-292. Kourides, I. A., & Kistner, R. W. (1968). Three new synthetic progestins in the treatment of endometriosis. Obstetrics and Gynecology, 31, 821-828. Dmowski, W. P., & Cohen, M. R. (1975). Treatment of endometriosis with an antigonadotropin, danazol. A laparoscopic and histologic evaluation. Obstetrics and Gynecology, 46, 147-154. Schweppe, K. W., Wynn, R. M., & Beller, F. K. (1984). Ultrastructural comparison of endometriotic implants and eutopic endometrium. American Journal of Obstetrics and Gynecology, 148, 1024-1037. Evers, J. L. H. (1987). The second-look laparoscopy for evaluation of the results of medical treatment of endometriosis should not be performed during ovarian suppression. Fertility and Sterility, 47, 502-504. Dmowski, W. P. (1987). Visual assessment of peritoneal impalnts for staging endometriosis: do number and cumulative size of lesions reflect the severity of a systemic disease? Fertility and Sterility, 47, 382-384. Fayez, J. A., Collazo, L. M., & Vernon, C. (1988). Comparison of different modalities of treatment for minimal and mild endometriosis. American Journal of Obstetrics and Gynecology, 159, 927-932. Steingold, K. A., Cedars, M., Lu, J. K. H., Randle, D., Judd, H. L., & Meldrum, D. R. (1987). Treatment of endoemtriosis with a long-acting gonadotropin-releasing hormone agonist. Obstetrics and Gynecology, 69, 403-411. Nisolle-Pochet, M., Casanas-Roux, F., & Donnez, J. (1988). Histologic study of ovarian endometriosis after hormonal therapy. Fertility and Sterility, 49, 423-426. Henzl, M. R., Corson, S. L., Moghissi, K., Buttram, V. C., Berqvist, C., & Jacobson, J. (1988). Administration of nasal nafarelin as compared with oral danazol for endometriosis. A multicenter double-blind comparative clinical trial. New England Journal of Medicine, 318, 485-489.